We hope that you are filled with love on this special day. In the spirit of Valentine’s Day, and because Heart Health is of utmost importance (According to Medical News Today, Heart Disease is the number 1 cause of death in the United States), we have some tips to share with you about heart health. Research points to inflammation as one of the most important issues to pay attention to. Inflammation is a major concern for your overall health and the deeper cause of heart disease. It is inflammation that causes cholesterol to be trapped in the arteries, and without this inflammation of the artery walls, cholesterol would move freely through the body as nature intended. 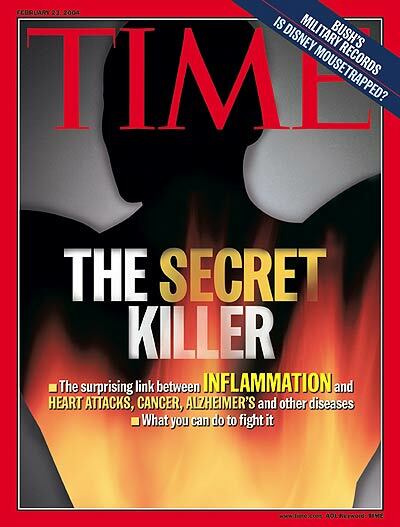 (Check out the Time Magazine Issue on Inflammation). Eat healthy fats making sure to keep a good ratio between Omega-3 and Omega-6 fats. Maintain a diet full of fruits and vegetables, and make sure to get enough Zinc, Potassium, Magnesium, Vitamin B, Vitamin C, Vitamin D, Vitamin E, and Vitamin K2. Research has found that Chiropractic Adjustments promote a healthy heart and decrease the risk of heart disease and heart attack. A study done in 2006 found that people who received a Chiropractic adjustment increased their Heart Rate Variability, lowering their risk of heart disease and other health problems. A good, belly laugh improves heart health by increasing your blood flow. A study done by the University of Maryland Medical Center in 2005 used laughter provoking movies to measure the effect of emotions on cardiovascular health. They concluded that laughter is linked to healthy functioning of blood vessels. Implement these 3 tips, and you will continue to decrease your risk of heart disease and improve your heart health. Treat yourself or your loved ones to a Healthy Heart Adjustment with our doctors. Take care of your heart, for its beat is the rhythm of life! Older PostWhat is the Most Effective Weight Loss Strategy for You?